The entertainment industry is supposed to be a way for society to tell its many stories. In the middle of the Twentieth Century those were often stories about the recent World Wars, or the obsessed-over American West. In time, they would broaden to become superhero stories, and stories about average people. They were often stories of strong men overcoming gargantuan obstacles. They were stories that, unfortunately, often erased and silenced the experiences of marginalized and underprivileged groups. Now 19 years into the new millennium, Hollywood is attempting to correct that narrow-mindedness, to spotlight the diverse array of perspectives our society has to offer. It is trying to do this not just by having white men write, direct and work behind the camera of stories about marginalized groups, but by reflecting diversity on the call sheet as well. But it still has a long way to go. This article will look at the continuing need for diversity in the entertainment industry, both in its hiring practices in front and behind the camera, and in the stories it elects to tell, and the characters it elects to represent. A key reason that the entertainment industry needs to prioritize diversity is that the real world is diverse. 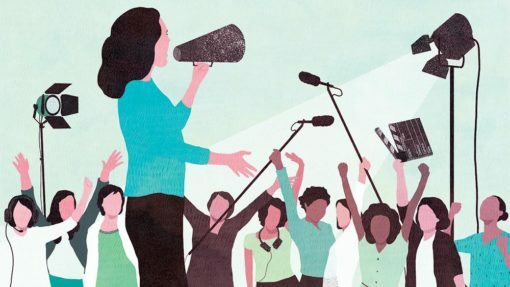 Half of the population are women, and yet women comprised 34% of speaking roles in 2017. And women of color fared worse – only 32% of that 34% were women of color. Clearly, those figures aren’t representative of real world diversity. Variety really is the spice of life. When all the creative jobs in the entertainment industry go to a homogenous group of men, the stories that you get out of it are… uniform, to be charitable. Having diverse perspectives in storytelling only makes the entertainment industry richer, and it opens audiences up to new ideas and ways of seeing. The biases of producers, casting directors and directors have unfortunately stifled opportunities for marginalized groups to get ahead in the industry. As important as it is to have diverse stories being told onscreen, it is just as important to have a diverse call sheet – to see diversity reflected in all departments, on- and off-screen. Luckily, organizations exist like Careers in Entertainment, from the Will and Jada Smith Family Foundation; if you are a young person from an underserved community, they offer help on starting your entertainment career through mentorship and opportunities. There is still a long way to go in the entertainment industry. Frances McDormand’s now-infamous Oscars speech, where she dropped the term “inclusion rider”, is a start. But in order for the entertainment industry to improve its diversity, it needs to know why diversity is so important. Representing the plurality of voices out there in the real world, exploring the breadth of perspectives, and ensuring that the industry remains equitable and unbiased are all important reasons for the entertainment business to renew its dedication to diversity. It might not happen overnight, but it’s a start. Previous readingWhat is CC Cream?